Humboldt Park. Photo by Jeramey Jannene. BAY VIEW, WIS. (April 15, 2019)—Nearly 3,000 trees have been removed from Milwaukee County Parks within in the last ten years due to infection, infestation and weather conditions. 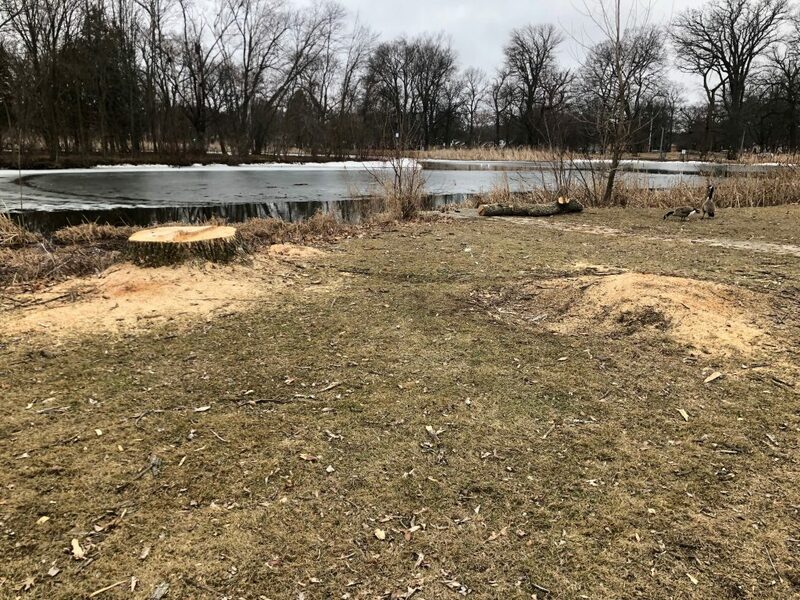 Roughly 79 trees have been removed from Humboldt Park alone, which covers 73 acres in Milwaukee’s Bay View neighborhood. Tree-filled neighborhoods lower levels of domestic violence and are safer and more sociable. 100 mature trees catch about 139,000 gallons of rainwater per year. Consumers shop more frequently and longer in tree-lined commercial areas and are willing to spend more. Each large front yard tree adds to a home’s sale price. In order to bring the benefits back to the neighborhood park, Humboldt Park Friends is hosting events starting in May to bring awareness and raise funds to purchase and plant 100 trees, delivering on a promise to keep the Bay View neighborhood park thriving for many years to come. “Our goal is to connect the community to the challenge and give back to our park through a series of program” said Jeremy Fojut Humboldt Park neighbor and volunteer for Humboldt Park Friends. Residents can donate a tree for $250 by going to http://www.humboldtparkmilwaukee.org/ or in person at any of the programs. May 22, 2019 – Humboldt Park Friends Mixer 5:30pm to 8pm: 342 East Ward Street, Milwaukee, WI 53207. Join Humboldt Park Friends at sponsor 1840 Brewing Company to learn more about the mission of “Hundred For Humboldt” while enjoying locally brewed favorites that will be seen across future events. 1840 Brewing Company is committed to Bay View and the longevity of Humboldt Park. $1 from every beer sold will go to the Hundred for Humboldt. August 10, 2019 – Humboldt Park Bocce Fest 12pm to 5pm: 3000 South Howell Avenue, Milwaukee, WI 53207. Humboldt Park Friends, along with area sponsors, will host Bocce Fest, a 16-team tournament. The benefit will include music, games, food and beer while part of the proceeds will go directly to “Hundred For Humboldt” while fostering community fun. Bring the family and join the fun cheering on teams while supporting the park. For complete details about each event, or to donate to the “Hundred For Humboldt” campaign, please visit www.humboldtparkmilwaukee.org. Humboldt Park Friends (www.humboldtparkmilwaukee.org) is a non-profit organization focused on engaging the Bay View neighborhood and greater Milwaukee communities and fostering park stewardship through volunteering, preserving park history, improving park amenities and safety, and sponsoring events and programming for education and enjoyment of Humboldt Park. Beginning at 3 p.m., Humboldt Park Friends will be selling freshly grilled corn on the cob for $2 per ear. HPF cleared cattails and other invasive plants from two sections of shoreline in autumn 2016 and 2017.